By Ormonde - Santa Bella by St. Serf. Ormondale was the only high class runner that emerged the sparse number of foals the great racehorse Ormonde got in California. Ormondale became the sire two top three-year-old colts, but his influence in American pedigrees is seen through his daughters and the daughters of his sons. 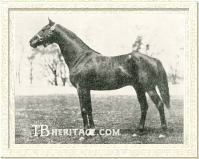 Ormondale was the sole foal in the 1903 "crop" of Ormonde, the undefeated English Triple Crown winner who, though largely infertile, had been purchased by California coal heir William O'Brien Macdonough from Argentina in 1893 for the enormous sum of $150,000. Ormondale's dam, Santa Bella (1893), by St. Serf, had been imported into the U.S. from England at the foot of her dam, Maiden Belle, who had been intended as a mare for Ormonde. Maiden Belle was never able to conceive by Ormonde, but Santa Bella did, and in 1903 dropped Ormondale at MacDonough's Menlo Park Stock Farm on the San Francisco Bay peninsula. He was the next-to-last foal by his sire, and the payoff Macdonough had been desperately waiting for. That the one foal Ormonde got that year was out of a daughter of St. Serf ( a son of St. Simon) must have been a thrill for Macdonough, who was convinced that the St. Simon - Bend Or cross produced superior runners, similar to Orme, Ormonde's good winning son in England. Orme's son, Flying Fox (1896), had already repeated his grandsire's feat by winning the English Triple Crown when Ormondale first saw the light of day. From birth, the bay Ormondale resembled his sire, and it increased with age. California turf writer and observer Tom Merry later said in reference to Ormonde, "...in one or two seasons he got no foals at all. Many say he never got one, but they can not fool me on the Futurity winner, Ormondale. His resemblance to the unbeaten Ormonde is too closely written in every outline of his anatomy to admit of a doubt." A British turf writer, well-familiar with Ormonde, saw Ormondale when he was at stud in 1916, and reported that he was "pretty much the stamp of horse I imagined him to be...a big, robust fellow." Walter Vosburgh said Ormondale was "very like his sire, except that he was longer in the bridle," and "he had better shoulders and a very short back." Most who wrote about him agreed he was a handsome colt. Racing for Macdonough, he was sent east to run as a juvenile. He ran third to Accountant in the Montauk, and third to Burgomaster and Pegasus in the 3/4 mile U.S. Hotel Stakes. He then thrilled Macdonough by winning the big race for juveniles in the U.S., the 6 - 1/2 furlong Futurity Stakes, which then was still held at the Coney Island Jockey Club's course at Sheepshead Bay. He beat a field of sixteen by half a length, with Timber second and Belmere third. At age three he won the 1-1/16 mile Broadway Stakes, beating Whinstead and the good filly Flip Flap, but in the Standard Handicap ran second to Whimsical, and in the 7/8 mile Swift Stakes at Belmont he was second to Halifax, giving him 7 pounds. Ormondale was not the racehorse his sire was, by a long shot, and not even as good as Orme in England, but the Futurity counted for a lot in American racing then, and his prospects at stud looked bright. Macdonough wasted no time in retiring him to stud, but not immediately in California, although his Menlo Park Stock Farm was re-christened Ormondale Stock Farm. Ormondale was put in the stud at Glen Helen Stud in Kentucky. 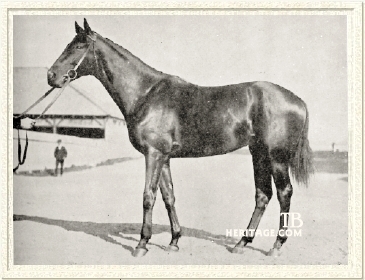 His only good youngster from his early years was LUCKY LASS (1909), bred in Virginia by H.T. Oxnard; she was a minor winner for August Belmont, but in his Nursery Stud she produced Lucullite (1915, by Trap Rock), a good juvenile until injured and a very good handicapper at age four. His grandson, Lucullite Running for Belmont's stable at age two, Lucullite won the Juvenile, Youthful, and Colorado Stakes, finishing second in the Keene Memorial, and third in the Tremont Stakes; he sustained a kick that fractured a bone in his leg and missed the important juvenile stakes in the fall. He did only moderately well at age three, but at age four, now in the ownership of Belmont's trainer, Samuel Hildreth, came back to win nine of his 16 starts in the handicap division, including the Manhattan, Aqueduct, Edgemere, Clarendon, Bramble, Lexington and Mt. Vernon handicaps, and lost by a head to the fast sprinter Billy Kelly in the Toboggan Handicap, giving him 11 pounds. Lucullite was later almost infertile in the stud, like a number of top running colts that had been in the care of trainer Sam Hildreth, who treated his runners with Fowler's Solution, a poisonous potion that likely affected the fertility of many of his famous charges. He did get some good runners from his small number of foals, including Only One (Dixie Handicap, Baltimore Handicap), Deduce (35 wins, including Harlem Handicap), Gildelia (Long Island Stakes), Grattan (Great Maerican Stakes), Mowlee (Excelsior Handicap), and Ladana (Clover Stakes, second Matron Stakes, second dam of Twilight Tear). Ormondale was brought back to California just in time to come up against the anti-betting legislation that killed racing in that state, and Macdonough, like many other breeders elsewhere facing the same strictures, shipped his yearlings, many by Ormondale, to England to sell, with dismal results. Of his California youngsters, the unraced PRINCESS ORMONDE (1912), from Ophirdale, a Haggin-bred daughter of Ben Holladay, was to become an influential matron through her daughter, Ormonda (1916), although that family was developed in Kentucky, where Princess Ormonde ended up. Ormonda, winner of twelve races at ages two and three , produced two high class runners: Osmond (by Sweeper), twice winner of the Toboggan and Laurel Handicaps, the Jerome Handicap, and 18 other races, and Brevity (by Sickle), winner of the Withers Stakes and unlucky runner-up in the Kentucky Derby. She was also the dam of the unraced Dustwhirl (1926, by Sweep), who produced Reaping Reward, Feudal Lord, Whirlaway and Panoramic (dam of Honeymoon). When Macdonough died in 1912, Ormondale went to John Madden's Hamburg Place stud in Lexington, Kentucky, where the aged Ogden, still prominent on the leading sires list, was standing, along with the old, blind Star Shoot, the Watercress son Hessian, the Darley Dale son Petaud, and the Persimmon son Sea King. The second part of his stud career in Kentucky was much more successful. Ormondale got two really high-class colts. The first was PURCHASE (1916), the "Adonis of the Turf," widely agreed to be one of the most beautiful animals to race within the memory of those who saw him. A golden chestnut somewhat on the leg, like his sire and grandsire, he was out of Cherryola by imported Tanzmeister. Bred by William Miller and sold as a yearling to the Brighton Stable, when it was dispersed shortly thereafter, he was purchased for $12,500 by trainer Samuel Hildreth, who said he was one of the greatest horses he had ever trained. He was just beaten out of the Three Year Old colt division championship in the U.S. by Sir Barton, having lost two of his nine races that year. He "went wrong" at the end of the season, and did not reappear on the turf until he was age five, when, in the colors of Harry Sinclair's Rancocas Stables, he won two sprints, after which he was retired to Sinclair's stud. His wins included the Empire City Derby, Jockey Club Stakes, Dwyer Stakes, Stuyvesant, Southamption, Huron, Saratoga, Katona Highweight and Bronxville Handicaps, and was second to Exterminator in the Saratoga Cup and to Eternal in the Brooklyn Handicap. His best son, Purchase When the Rancocas Stud was dispersed in 1930, the aging Purchase was picked up for $2,000 (at the height of his career Hildreth had turned down $100,000 for him). He ended his days at William Elder's Merryland Farm in Maryland, dying in 1936. He was a great disappointment at stud, with an AEI of .89, and very few foals for his long life -- like his grandsire, he proved almost sterile, but in his case the suspect agent was probably Fowler's Solution, a concoction containing arsenic and strychnine, which Hildreth regularly used on his racehorses. His winners included his daughters, [Fire of] Orissa (Fashion and Clover Stakes, winner of $13,325), Sabine (Interborough Handicap, winner of $9,345), Semba (Keene Memorial Stakes, United Hungts Sporting Plate, winner of $11,250), Miss Purray (Victoria Stakes, winner of $19,240), the gelding Chase Me (winner of $8,500), and a number of other minor winners. 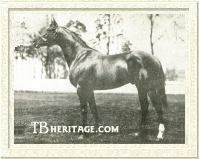 Purchase's daughter Orissa was bred to Lucullite (see above), producing the in-bred Only One (1931), a winner of 13 races, including the American Legion, Baltimore, Delaware, Dixie, and Prince Georges Handicaps; Orissa's other good son was the gelded Donor (by Challedon), winner of $367,560 over four seasons, including the Champagne Stakes at age 2, the Jerome Handicap at age 3, the Butler Handicap and Narragansett Special at age 4, and the Manhattan and Saratoga Handicaps at age 5. The other good colt by Ormondale was ORDINANCE (1921), bred by August Belmont from the Rock Sand daughter Dona Roca, also the dam of the good runner Dunlin. Ordinance was another Ormondale colt that just missed the three year old championship. He won five of his eight races at age three, including the Rainbow, Long Beach, Stuyvesant and Mt. Vernon Handicaps, in the latter beating Mad Play and the ultimate year-end champion, Sarazan. He also won the Empire City Derby. He was sold privately for somewhere between $50,000 and $80,000 to Helen Hay Whitney when Belmont's Nursery Stud was broken up in January of 1925 and was put into her Greentree Farm stud in Kentucky. He died that same year, leaving behind one stakes winner from his first and only crop, Justinian (1926), a winner of $21,780. Other Ormondale runners included STAMPDALE (1922), out of Post Mark, an unraced daughter of Star Shoot: he won 33 of his 203 starts, running mostly at the claiming and allowance level. The gelded WORD OF HONOR (1924), out of the unraced Lady Doreen, by Ogden, won six of his 17 starts over fences; at age seven he won the Llangollen Cup and the Prince of Wales Gold Cup Steeplechase. He was a half brother to the great race filly Princess Doreen. BOBAHSELA (1925), a colt out of an unraced Trap Rock daughter, Trappoid, won 17 of his 85 starts and $43,880; his wins included the Chesapeake Stakes and the Jennings Handicap. BANNER BRIGHT (1927), out of Royal Purple, by The Finn, was a high-class filly; she won the Latonia Oaks and five other races in 45 starts. Ormondale's daughters that had an influence as broodmares included the aforementioned Lucky Lass and Princess Ormonde. In addition, he got SILK LADY (1915), whose daughter, Sadie Greenock (1933) won two races in ten starts and in the stud produced Swoon (1942), a winner of five races that became a Kentucky Broodmare of the Year in 1957, having produced the 1957 Champion Sprinter and Champion Handicap Horse, Swoon's Son. Another influential matron was O GIRL (1924), from Our Filly, by Hessian. She won 3 of her 30 starts at ages two and three, and in the stud produced Fiji, the disputed best filly of her generation, winner of the Kentucky Oaks, Latonia Oaks, Sallan Cup, and Hyde Park's Labor Day Handicap. Fiji's daughter, Isolde, produced Kentucky Derby winner Dark Star and was second dam of Kentucky Oaks winner Blue Norther. Ormondale's daughter CAMILLA S, out of Dolly Higgins (also dam of Star Fancy, who produced the great Crusader), got three good producing daughters, all by Sweep: Sweepilla (winner at age 2 of the Cuban Juvenile Stakes), Nimble Hoof and Brush Along. These mares produced winners and such horses as Bald Eagle (1955), Damister (1982), and Coldstream (1933), descended from them. Another Ormondale daughter, PASSING SHOWER (1916), from Passany, by Hamburg, was second dam of the Suburban Handicap winner Mokatam, and established a successful female line. Despite Purchase and Ordinance, Ormondale was a poor sire; he hit number eleven on the leading sire's list in the U.S. in 1919, the year Purchase was three, and barely clocked in on the top twenty of the leading sire's list in 1924, Ordinance's three-year-old season, when he was number nineteen. His legacy was through his daughters.